Chateau / Country House376 sq. ft. 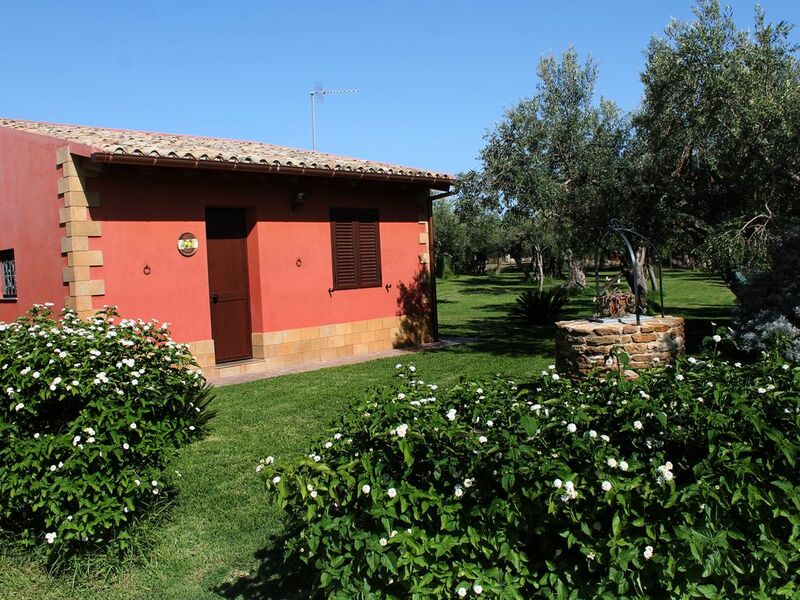 The house is on the edge of a large park of about 2000 square meters, surrounded by plants of olive trees, under whose canopy you can relax on deckchairs perhaps with a good book or simply to enjoy nature with its sounds. The house in addition to the 2 bedrooms, bathroom and kitchen, has an increasingly private veranda overlooking directly onto the lawn, where you can enjoy the best lunches in direct contact with nature. Next to the house we find the laundry area and a barbecue grill where the excellent Sicilian products, and why not the fruits and vegetables that can be found in the garden or in the garden master, zucchini eggplants tomatoes peppers .... and then also peaches watermelons the cantaloupe melons ..... fresh eggs they collect directly to the guests, and slush to the fruit, and then you can not miss the fish and pizzas of Sciacca. To welcome the guests there will be Antonella who is the owner / responsible of the structure, and then find Salvatore Toto said that deals with the tasting side. In fact, it is he who while staying entices guests with its specialties. Drawing inspiration from the evening will prepare the "bread cunzato" a Sicilian specialty, which is to stuff the warm bread with local products, such as oil of his business, salted anchovies fragrant, oregano, salt, pepper and sliced ​​tomatoes. Then it's up to the seasoned anchovies on plate with lemon and chives oregano oil. And olives, artichokes and "passuluna" ie black olives and fresh cheese. There is also the sweet evening with cannoli filled at the time with sweetened ricotta and chocolate chips and pistachio. But let us not forget the granite evening that Antonella prepares for you. Any for all tastes, you can enjoy the white and tasty lemon, strawberries with red and inviting wood, mandarin and then the house specialty mulberry granita with a strong flavor and intense color amaranth. If there are families with children and always he who will lead the whole party around the estate with the tractor to pick vegetables or make a visit to the "farm", to see the cow eating hay, goat jumping all ' inside the corral the chickens that run undisturbed eating here and there, and then at the end to collect all the eggs to bring everyone to his house. When you stay in Sciacca it is the ideal place to visit all of western Sicily. It takes just 45 minutes to arrive in Agrigento, here you can visit the Valley of the Temples, to go back in time, to plunge into the past and relive the glory of ancient Greece. The same thing can be done by moving toward Castelvetrano, a 20-minute drive will get you on the hill where is the archaeological site of Selinunte, and you can see the Acropolis of ancient Greece. Just move to the city of Segesta to admire another greek temple in the archaeological site of Calatafimi Segesta, Italian town in the province of Trapani in Sicily. With an hour's drive you can visit the city of Palermo, capital of the island rich in history and monuments to visit, and from here you can move in Monreale other Sicilian pearl. But you can not leave out the fantastic western tip of Sicily, Trapani with its famous salt mines, Erice town postcard from where you can admire a fantastic view from the top of its 751 meters high. At 15 minutes you arrive at the village of Sambuca di Sicilia elected most beautiful village of Italy in 2016, here you can enjoy the traditional "Minni of virgins" and visit the famous Lanes Saracens. And after a long run we can not leave the town of Sciacca, with its beaches all free, its monuments from all the dynasties that have dominated this country crossroads of many sea routes, a place of passage with its customs, rich in history and traditions, a great place to eat fresh fish in the innumerable restaurants and trattorias. Not least are the pizzerias that lure passers-by with the typical odor. In Sciacca you can visit the historical center also created the Enchanted Castle inconpreso genius of its owner Filippo Bentivegna haunted by visions, which he saw faces everywhere, and Mount Kronio, which legend indicates as the Cave of Daedalus, with its unique Steam caves of their kind, the result of interesting studies by cavers from all over the world. To those who love diving, here is the ideal place to admire the unique backdrops of their kind, the island of King Ferdinand appointed by leading scholars in the field for its uniqueness, emerged in 1831 as a result of a volcanic eruption was short-lived, it He sank again the following year. In the sea of ​​Sciacca they live coral colonies, famous coral in the world, by the bright red color, which is working in the numerous workshops run by master highly skilled goldsmiths. In the city there are about 40 all churches dedicated to the cult of Christianity. Palaces and monuments of various periods and the famous walls with doors of Sciacca, originally the doors were five hours will remain 3, doors and walls delimiting the boundaries of the city and protected it from enemies. We will be happy to have you as guests, Sciacca awaits us there accvoglieremo offering you the best of everything. Esperienza eccezionale con una accoglienza da parte di Antonella e Salvatore incredibile: ogni giorno ci offrivano un prodotto dei loro orti. Olio, frutta, pane cunzato. Inoltre a disposizione degli ospiti nsalata, pomodorini, zucchine ed altre delizie. Vi ricorderemo. Nous avons particulièrement apprécié l'accueil chaleureux d'Antonella et son mari, qui se sont montrés très disponibles pour accompagner notre séjour. Le logement est très bien appointé assez grand avec une terrasse donnant sur un jardin. Se loger à la ferme est très agréable - on dort mieux car c'est calme. Le lieu est bien situė pour explorer l'ouest de la Sicile et se rendre à la vallée des temples à Agrigento. Sciacca est une ville moyenne avec un centre historique qui vaut la visite. C'est aussi un port de pêche, ce qui permet d'acheter, ou de manger au restaurant, du poisson de grande qualité. Quant aux produits de la ferme l'huile d'olive, les olives et les grenades sont très goûteux. En conclusion un lieu de séjour hautement recommandable. Tariffe scontate in relazione alla durata, L'energia elettrica si paga al consumo (all'arrivo viene rilevato il numero del contascatti, e al check-out viene fatto il conteggio del consumo). Caparra richiesta alla prenotazione, Consegna delle chiavi da parte del Proprietario.